How do you implement Desktop-as-a-Service? Conexlink engineers researched and studied extensively to come up with our patent-pending technology to automate the creation of networks and desktops, on top of Infrastructure-as-a-Service. We partnered with Microsoft and implemented the best practices of Azure Desktop hosting. Am I the administrator of my network, or do I need to contact you for any changes I want to make? When you create a tenant Windows Network in Azure cloud via MyCloudIT Portal, you are the administrator. You will be able to assign admin desktop users that can install applications, and log in to any server on the domain/Vnet. All this can be set up in your control panel. Your Control Panel is accessed via any modern browser, including the browsers in Windows 10, Edge and IE11. Is each remote desktop an individual Virtual Machine? The MyCloudIT Platform uses session-based desktops. There is one session-host server for every N user desktops (configurable). This significantly drives down costs compared to the traditional VDI model of one Virtual Machine per desktop. However, you have the ability to assign a virtual machine to a user if you wish. What is the company-shared disk? How is this different from individual desktop storage space? Personal Private Storage: Space each desktop user can use for its profile data and personal files. Company Share-disk: Common space visible to all desktops. Commonly use as the Company shared folder. Is the client data on the desktops and company-shared disk replicated to ensure Disaster Recovery? MyCloudIT, by default, takes advantage of Azure’s Locally-Redundant Storage (LRS). LRS replicates your data within the region. To maximize durability, every request made against data in your storage account is replicated three times. These three replicas each reside in separate fault domains and upgrade domains. You also have the option to set up Azure Backups via the MyCloudIT portal – up to 54TB of data. You are able to select from GRS or LRS for the data replication. When setting up Backups, MyCloudIT automatically creates the Azure Vault on a storage account in your Azure subscription, install the client on the File Server/Domain Controller and schedules the backup and retention policies based on your inputs. For more information about Azure Backups please click here. What are the server configurations and virtual machine sizes of the templates offered? Each template was designed following Azure Desktop Hosting best practices and were tested rigorously using LoginVSI. In our experience, we have found that D-series Virtual Machines in Azure perform way better than A-Series regarding CPU and RAM, hence giving a better desktop user experience. Although it is possible to have the same templates using A-series VM’s , the performance provided by D-series is far superior. D-Series also has a non-persistent SSD drive that can be very useful for end users on many scenarios. Why not more than 55 desktops? We are focused mainly on solutions for Small and Midsize businesses. A DaaS (Desktop-as-a-Service) solution is normally all-in, meaning that you remove all servers from on-premises and move to a 100% cloud model. We have found that companies bigger than 50-60 desktops, normally need a hybrid model that requires custom set-ups, VPNs, special policies, etc. Although it is possible to achieve complex models with Azure Desktop Hosting, we are focusing on a 100% automated solution in which you don’t need to call us or talk to us, something that “It just works” with a few clicks. 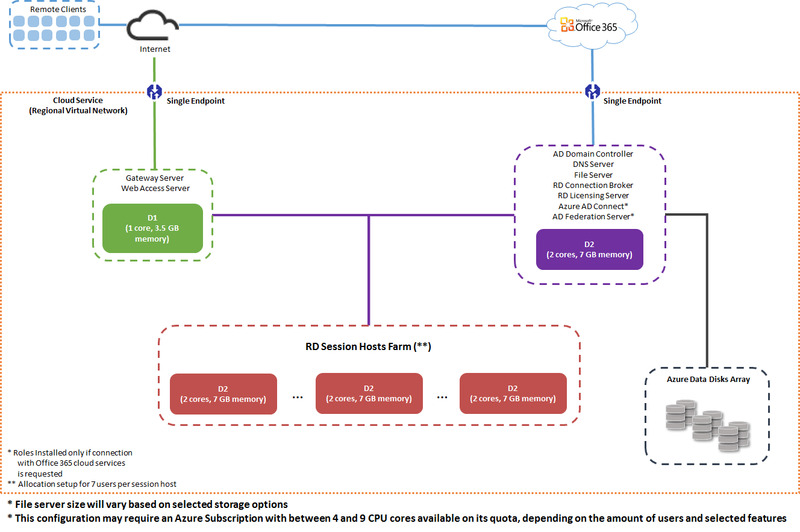 How does automated connectivity with Microsoft Office 365 work? More likely than not, if you are thinking about bringing a customer to Azure Desktop Hosting, this customer is already using Office365 (Exchange online, OneDrive, Skype for Business, etc) or you are going to offer the services as a bundle: Office365 + Azure Desktops. In either case, you want Users and Passwords to be the same among the virtual desktops and Office365 apps. This is accomplished by implementing Azure AD Connect. MyCloudIT takes care of this integration for you. At the moment of the network creation, or after the network is created, you have the option to DirSync an Office365 domain with the Domain Controller/AD of you Azure Desktop hosting Deployment. Our engine will bring the cloud users down to the AD, upload any user that doesn’t exist in O365, install the Azure AD connect client, and sync the users information. Can I install Line of Business software and applications on the desktops? Yes, you can install any software you want. Any software installed on the session host virtual machines are accessible to all the desktops in your network. Can I spin another Virtual Machine, like a SQL server, and join it to the domain? Yes, you can, our system automates this process for you. You will be able to select and deploy any Windows Server or SQL Server offered by Microsoft Azure. I want to resize some of my VMS, but I do not see some of the VM sizes available in the Azure Region. Specifically, the new VM sizes like the D_v3 and E_v3 series do not show in the list of available VM sizes. This situation is pretty common, it actually happens because Azure places your VMs in clusters within the Azure Region. Sometimes, the cluster Azure places your deployment in does not have the D_v3 or E_v3 sizes available because your existing deployment does not require the D_v3 or E_v3 sizes. When you request a resize, our platform queries Azure for the VM sizes you are allowed to resize to. Since some sizes are not available in your current cluster, they are not available as resize options. The most reliable way to gain access to these new sizes, is to do a complete shutdown of your deployment. You will need to wait for your VMs to be fully deallocated; then all of the VM sizes within the Azure Region will be available to you. Now you can resize the VMs you want to resize to any of the available sizes, then restart your deployment. Azure will deploy your deployment to a cluster based on the resources your deployment requires. What protocol is required for the remote connection? RDP 8.1. For more on the RDP 8.1 Protocol, visit Microsoft’s Remote Desktop Services Blog. We do not use Citrix HDX or PCoIP protocols. Does any thin/zero client work to connect to the virtual desktops? Yes, as long as the thin client supports RDP 8.1/RemoteFX, it can be used to connect to the virtual desktops. What are the preferred Remote Desktop Clients (RDC) to use? For Windows 7 , click here. For Mac or IPad, click here. Can I connect this DaaS deployment to an on-premises network, to have an in-house DC replica? Yes, Microsoft Azure datacenters are global. 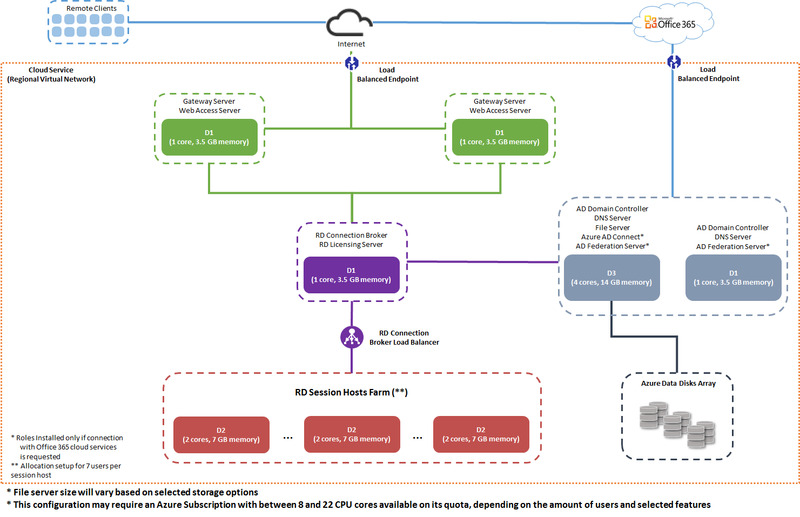 All features offered by Microsoft Azure can be implemented to your DaaS deployments, including VPN site-to-site or point-to-site connectivity to on-premises. What type of desktop experience will my users have? RDS deployments are based on Windows 2012 R2 servers. At the moment of the network creation, or even after its created, you have the option of setting a Windows 7 experience, or a Windows 8 experience. MyCloudIT engine, upon your selection, puts a skin on top of the Windows 2012 UI to make it feel like Windows 7 or Windows 8. We will release the Windows 10 experience as soon as Microsoft releases Windows 2016 server to general public in 2016. – Speed of the internet connection: At least 1MB/s with less than 50ms latency for a Small Network. – RDP client type: Microsoft Branded software clients and Thin or Zero clients made specifically for RDS and RDP 8 protocol, with good reviews. – Type of Load on the RDSH servers: On Session-based desktops models, N users shared a RDSH server. This means that if one desktop user is watching YouTube or, for example, running an Excel macro on 200k rows, all users on that server will be affected and will experience a poor performance. In this sense, our templates are designed considering a medium workload and, by default, with 7 users per each D2 Session Host VM to minimize a problem like this. However, it will be your responsibility to monitor CPU and RAM and make sure that the Session Host VM sizes match the type of workload of your customer, otherwise it will “feel” slow. Can my users connect from a mobile device? Yes, your users can connect from any kind of PC, Mac, laptops, Tables, even phones. All they need is the Microsoft Remote Desktop Connection client available from the App Store, Windows Store or Google Play. Can I use my local/network printers to print from the virtual desktops? Yes, local printers and other network devices will be visible on the virtual desktops. This is all configured on the RDP client. Another option is to create a site-to-site VPN connection between on-premises LAN with the Azure Vnet, and printers, scanners, etc will be visible by the remote desktop. Can I see my local disks and folders in the virtual desktop? Yes, in the RDP client there is an option to redirect local folders so they are visible on your desktop. Can I only publish the Applications like in Azure RemoteApp? You can use our RemoteApps feature and publish only the applications you want. In the MyCloudIT portal, after you have created your deployment, there is an feature call “RemoteApp” that will allow you to select the applications you want to publish with a just few clicks. The system will handle all the back-end configuration for you. Many customers prefer to use MyCloudIT with RemoteApp instead of Azure RemoteApp service because they have more control over the underlying infrastructure. For example, they can select the size of the VMs, schedule off/on times, link users with Office 365, etc. In MyCloudIT, Do I need Citrix or VMWare licenses? What about RDS SALs/CALs? You do NOT need to purchase VMWare or Citrix Licenses. MyCloudIT will deploy, manage and monitor your DaaS business, however you need to Bring your Own Azure and Bring your Own Licenses (RDS SALs/CALs) via SPLA contract. You also have the option, in case you don’t have or want to have an SPLA contract, to purchase the RDS SALs from us easily from the MCIT portal. Can I bring my or my customer’s RDS CALs instead of using SALs? Yes, you can. This benefit is available to Microsoft Volume Licensing (VL) customers with eligible server applications covered by active Microsoft Software Assurance (SA) contracts. Not only will license mobility make the transition easier for existing SA customers, it provides customers who prefer to purchase perpetual licenses the ability to continue doing so while still taking advantage of the efficiencies of the cloud. All customers using License Mobility through Software Assurance must complete a license verification process and Microsoft will ensure that the customer has eligible licenses with active Software Assurance. To start the verification process and review additional details, go to: http://www.microsoft.com/licensing/software-assurance/license-mobility.aspx. Please contact support@mycloudit.com if you need assistance with this kind of RDS licensing.